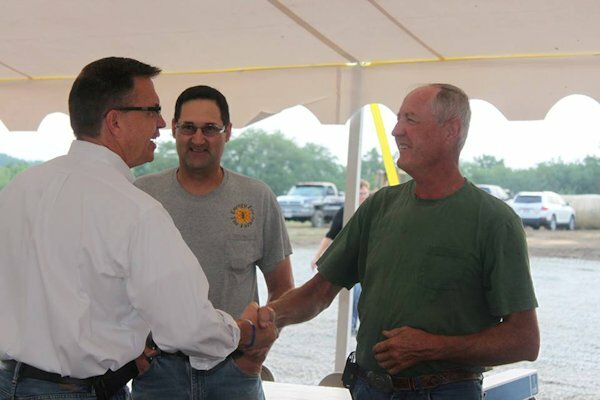 STRONGHURST-Bobby Schilling (R-Colona) was welcomed back to Henderson County on Saturday when more than 100 supporters attended a Breakfast Bash for Bobby in support of his candidancy. The Henderson County Republican Party held the fundraiser breakfast for Schilling with "historic turnout". Bill Knupp (newly appointed Henderson Co. GOP Chairman) is feeling pretty good about his first fundraiser in Stronghurst for Schilling-former Congressman of the 17th District who is out to reclaim his lost seat in the last election. "We ended up raising a record amount of money for a congressional fundraiser in Henderson County," said Jon Schweppe, Communications Director for Schilling. We really did have 100 plus people. It was amazing!" Schilling, who served as Henderson County's Congressman in 2011 and 2012, has been frequently seen in towns like Stronghurst, Gulfport, Terre Haute, Lomax, Gladstone, Biggsville, and Oquawka. Schilling is running again against incumbent Congresswoman Cheri Bustos (D-East Moline). "I'm tired of seeing small communities being ignored," Schilling said. "Every town matters. Look, I'm from a small community. This is America. I truly believe a representative should be helping every town in their district, not just the population centers. This is about helping people." Schilling delivered a passionate speech about his vision for our country. "How many of you believe that you have it better than their parents did?" Schilling asked the crowd at one point. Nearly every hand went up. "Now how many of you believe that your kids and your grandkids are going to have it better than you?" The crowd was silent and no hands went up. "That's a problem. That's the disappearing American dream. Our country is in deep trouble and we have to fix it. We have to be problem solvers. This isn't about Democrat or Republican. It's not about going out to Washington to have a title. This is about serving people and creating a better America for our children and grandchildren. Are you with me?" Bobby Schilling was born and raised in Rock Island, Illinois. He has been married to his wife, Christie for 28 years and together they have 10 children. Schilling represented the Illinois 17th District in the U.S. House of Representatives from 2011-2012, serving on the House Armed Services Committee, the House Agriculture Committee, and the House Small Business Committee. Schilling is seeking another term and says he is running against "incumbent liberal Congresswoman Cheri Bustos" so he can work to reclaim our country and our freedom.